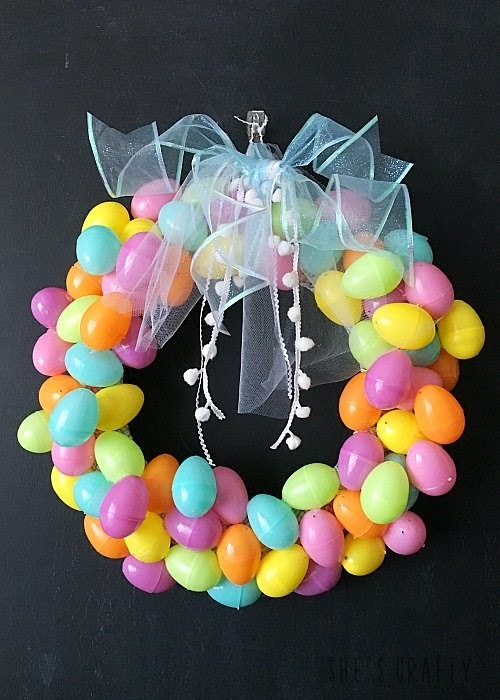 Are you looking for something FUN and Festive to hang on your front door for Easter? And bonus points for the project to be inexpensive and easy? 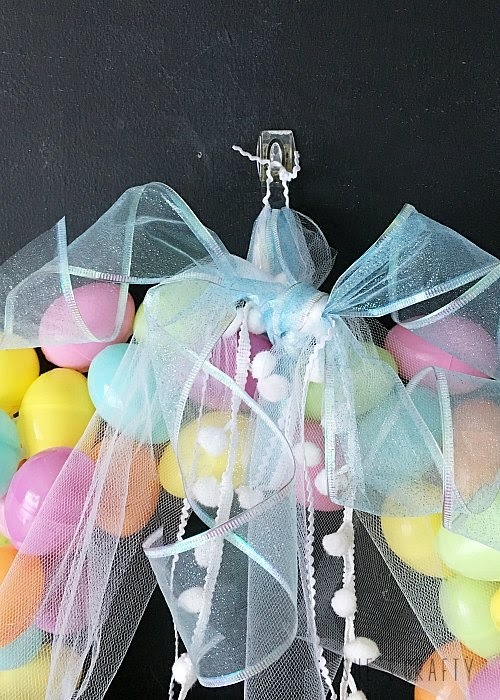 This DIY Pastel Egg Easter Wreath is all of those things! I like to put something decorative on my front door, like a wreath to bring some holiday cheer to my front porch- Valentine's Day, Lavender for Spring, Fall Vintage Mailbox Door Hanger. 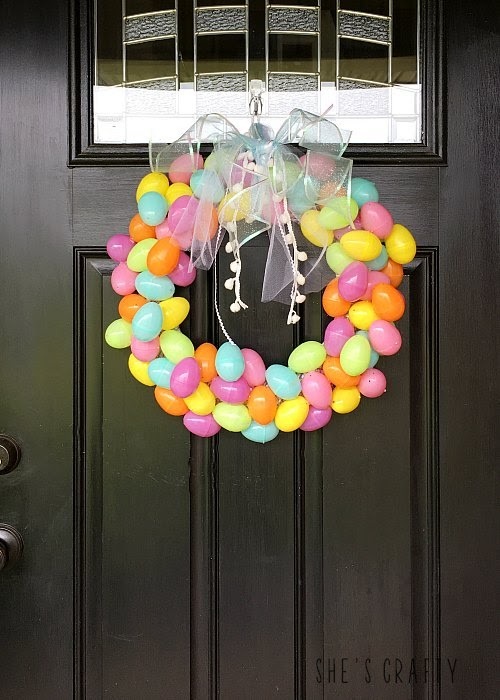 I do so many wreaths that I really didn't need to make another, but as I was browsing Easter decor in the store, I was inspired by the bright pastel eggs and decided to make a Pastel Egg Easter Wreath for my front door. 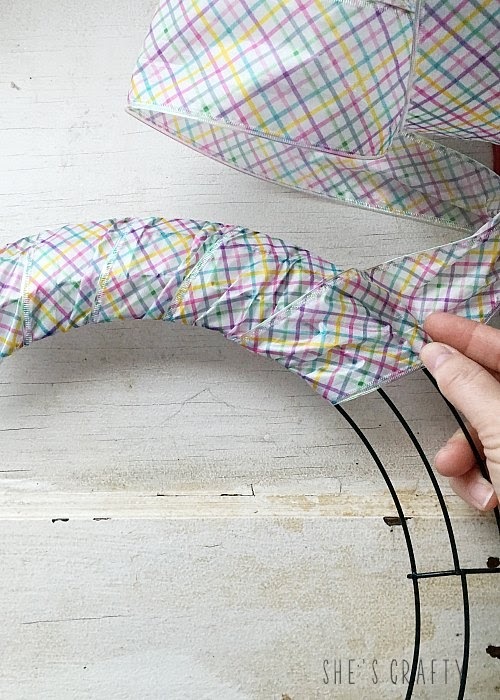 Wrap ribbon around wreath form to hide the mechanics of the wreath. 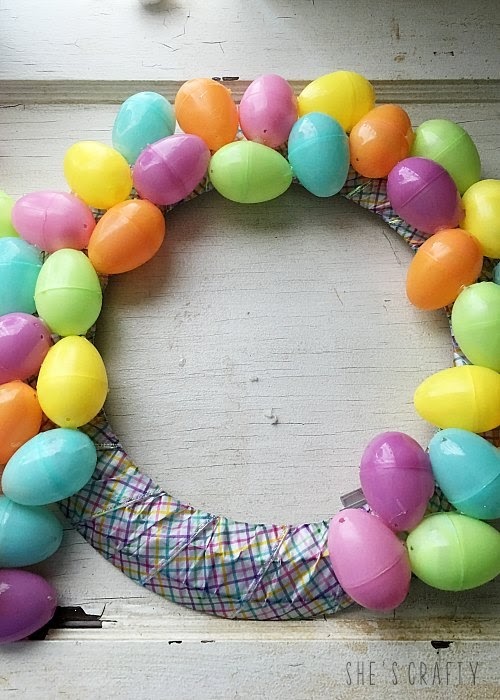 Glue Eggs in random colors around the wreath form, with some on top of others. 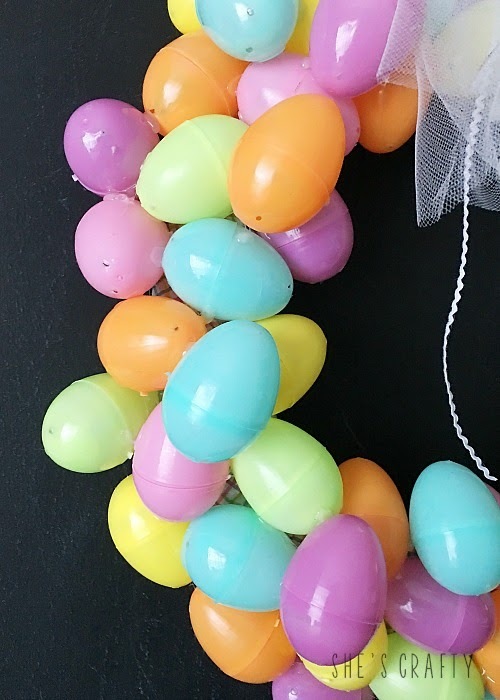 Use a lot of glue to hold the eggs to each other. Repeat. Repeat. Repeat. Tie ribbon and pom poms to the top of the bow for decoration. I used wire edge ribbon so I could shape it into curls. Also tie a small ribbon to hang the wreath from a hook. 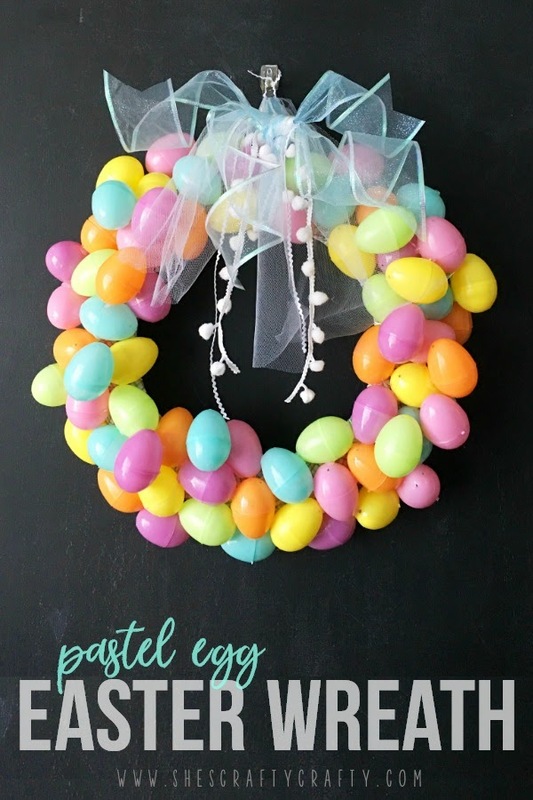 This Pastel Easter Egg Wreath is the perfect touch on my front door to celebrate Easter! And it just goes to show that projects don't have to cost a lot of money or be difficult to have a big impact! 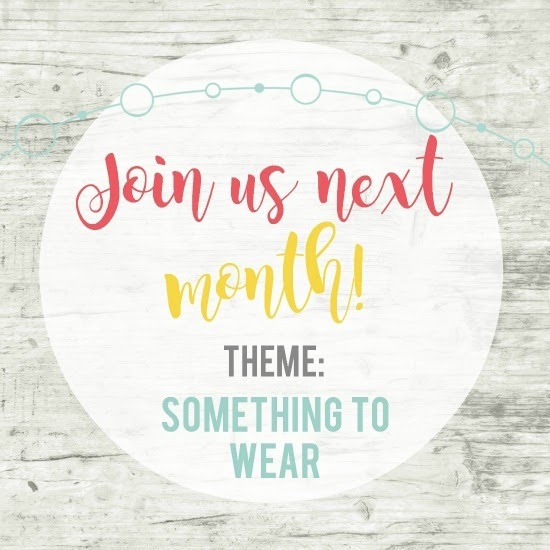 Don't go yet, it's the 2nd Wednesday of the month and that means the Inspire My Creativity Link Party. How fun! Such a great idea to use up some of the eggs we collect every year. Those eggs seem to multiply from year to year don't they? It's a great idea for those leftover eggs, for sure! So pretty and simple. Thanks for sharing!!! I've had the supplies to make a wreath like this in my craft area for TWO YEARS! ARGH! It's so embarrassing! Oh I totally do that too! I am a craft supply collector! I love how cute (and inexpensive) this is! And it actually looks easy enough for me to make! Thank you Chelsae! You can totally make one! Oohhh i love this! The pastel colours make the whole thing look soo good. That is so cute and pretty cheap. 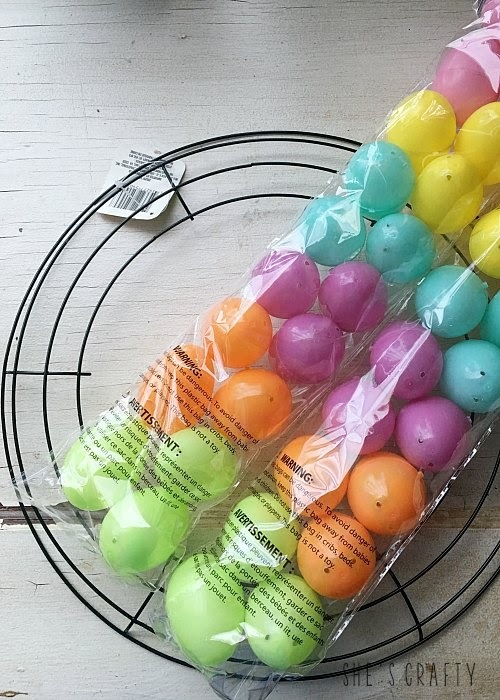 The eggs are like $1 a pack and don't need much ribbon. You can do so many different pastels. That's one of the things I loved about this project - totally affordable! I love the look of the pastel against your dark door.